What Will Be The Mobile OS Of The Future? This is indeed an interesting question. The article Ultimate Mobile OS Showdown: iPhone vs Android vs webOs vs Blackberry vs Windows Mobile vs Symbian tries to compare the good and bad of each of the common mobile OS at hand today. 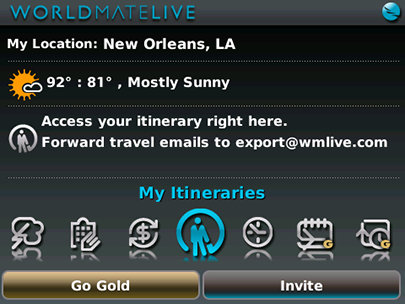 WorldMate is mentioned in this article as one of the better BlackBerry OS third-part apps for tracking travel plans. Personally, I like the Windows Mobile OS, but I have to agree this is probably a dying mobile OS. iPhone is very chick but if I have to gamble on a winner it will be the Android. Its openness and support from a plethora of vendors will make it the winner, eventually. London, 13 July 2009 – Nokia Series 40 mobile phones are now being shipped with a direct, emoze push messaging software link in the OVI download folder so that users can quickly set up their favourite messaging data sources such as Gmail, Hotmail, Facebook and so on, pushed to their mobile phone, with real-time, secure synchronization.